A straphanger fans herself with a newspaper while waiting for the train. 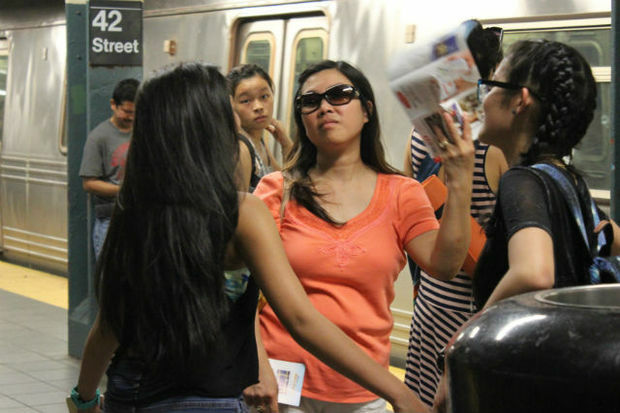 "Subway platforms may be hot today," the MTA warned straphangers Monday morning. By 10 a.m., that P.S.A. 's timestamp, plenty of commuters already had the pit stains to prove it. The tweet also failed to mention heat's muggy cousin, humidity, which is what makes us particularly miserable waiting for that air-conditioned train to pull into the station. DNAinfo New York took a very sweaty tour of several Manhattan subway stations to determine which were the hottest and which the most humid. We then calculated the "apparent temperature" for each, or how hot they feel if you factor in humidity. Vying for the title of "most unbearable" were Union Square and Times Square. Temperatures on the uptown 4/5/6 platform at Union Square reached 96.6 degrees, according to our digital thermometer. The relative humidity (or the ratio of the current absolute humidity to the highest possible absolute humidity, a point at which the air can't hold any more vapor) was 55 percent. Plug the two into this equation, and it felt like 109 degrees. On the platform for downtown N/Q/R trains, DNAinfo measured a temperature of 96 degrees and a relative humidity of 60 percent, making it feel like 110 degrees. But relief could be found at the Lexington Avenue/63rd Street station, among the deepest in the city at 100 feet below ground level. The temperature on the downtown F platform Monday afternoon bottomed out at 82 degrees, the humidity at 56 percent. It felt like 87 degrees. And a woman fanning herself on the uptown 4/5/6 platform at Grand Central didn't know how good she had it. Grand Central is the only subway station with chilled air, which is piped in from the terminal above. The temperature was a moderate 86.5 degrees, and the humidity was a normal 46 percent, close to today's above-ground average. It felt like 91 degrees.